Many growers in the Sacramento Valley woke up this morning with white tipped grass in their yards. If you didn’t harden off your young walnut trees by beginning to withhold water in September and forming terminal buds, they are at risk of freeze damage. Fortunately, since it has been wet this fall, most orchards have a moist soil profile which should help mitigate the damage. Painting young walnut trees prior to a freeze can help prevent damage, but if you didn’t paint early, painting AFTER the freeze can still help decrease damage. Wilbur Reil, Farm Advisor Emeritus, found that when trees were painted a week after a freeze event only 18% showed damage, compared with 46% damaged in the unpainted trees. To know if you have freeze damage that warrants painting, look for darkened cambial tissue below the bark. To paint, use an interior latex paint, diluted 50-75% with water, and paint trunks and branches (if you have a bucket of ‘tree paint’ laying around, this is often thinner than interior latex paint and may not need thinned out as much). Remember that you are simply providing a reflective coating to help prevent further damage from sunburn, not trying to encase the tree in latex. A very thick coat of paint is not necessary. Painting any parts that may be damaged should improve recovery and protect against winter sunburn of affected tissue. Later on this winter, after exposure to winter suns, symptoms will resemble sunburn. 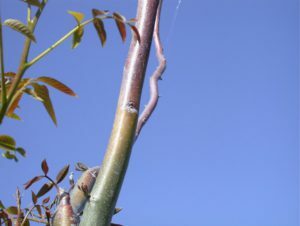 Damaged branches are most likely to be found on the southwest side of the tree, especially on horizontal branches with most direct sun exposure. Purple-ish colored branches are indicative of winter sunburn following autumn freeze damage. Photo: J. Hasey.